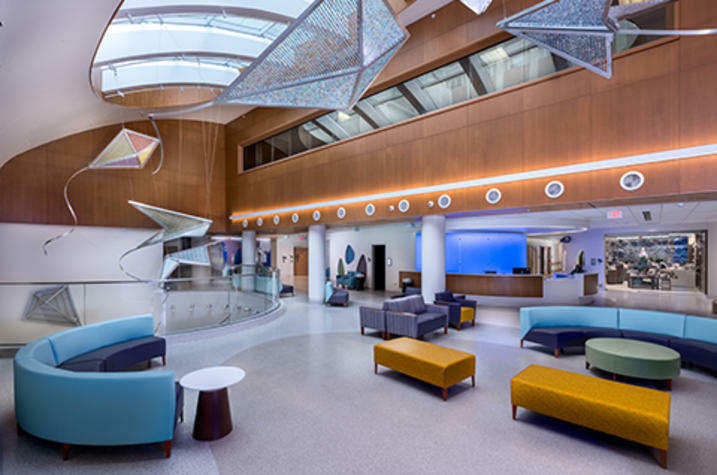 LEXINGTON, Ky (June 4, 2018) – When you enter the new lobby of the Kentucky Children's Hospital (KCH), located within UK HealthCare's Chandler Hospital, the first thing you notice is a group of massive, colorful kites that seem to soar below the lobby's skylight. 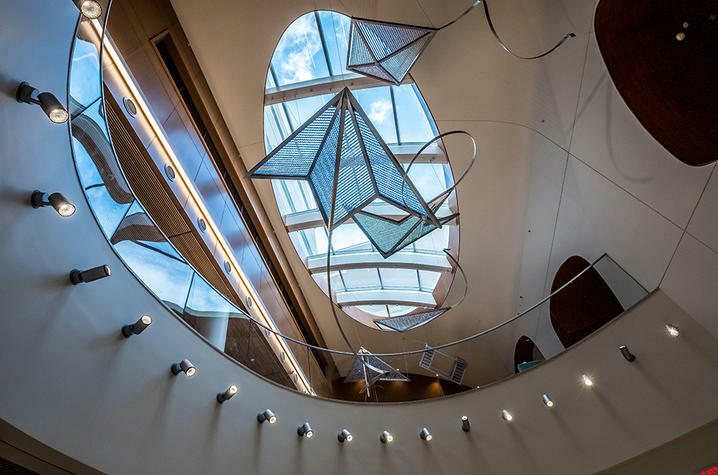 The kites are sculptures by artists Erika Strecker and John Medwedeff, commissioned by UK HealthCare to not only be a public art piece, but to help "provide a healing environment enhanced by artistic expressions." When an international call went out to artists, Strecker, a Lexington native, and Medwedeff, who is based in Illinois, rose to the challenge. They looked at architectural renderings and blueprints of the lobby, which was then still in the early stages of construction, and saw beyond the steel beams and unfinished walls. To them, the space under bright skylights was evocative of an open sky. "We went through the litany of things that flew and hung, and thought about what would be happy and uplifting," said Strecker. "Early in the process we considered an abstract bird," said Medwedeff. "But we felt it lacked a strong enough reference for children. We had already arrived at the idea to use thousands of marbles for color, transparency and reference to children's play." With the concept of play in mind, the idea moved from birds to kites. The duo proposed a massive installation called "Exuberance!" to the selection committee. The design included seven aluminum kites with plastic tubes filled with colorful marbles that would be suspended below the lobby skylights. Among the requirements outlined by the selection committee, proposals needed to provide a playful and child-friendly focal point and create an uplifting and comforting environment. Jason Akhtarekhavari, Arts in HealthCare specialist and art preparator for UK HealthCare, noted how Strecker and Medwedeff's design resonated with the selection committee. "Besides feeling that the kites scored highly on all parameters [outlined in the prospectus], there was this sort of unspoken consensus among the members of the committee," said Akhtarekhavari. "Everyone just sort of knew that the kites were the right fit for KCH." 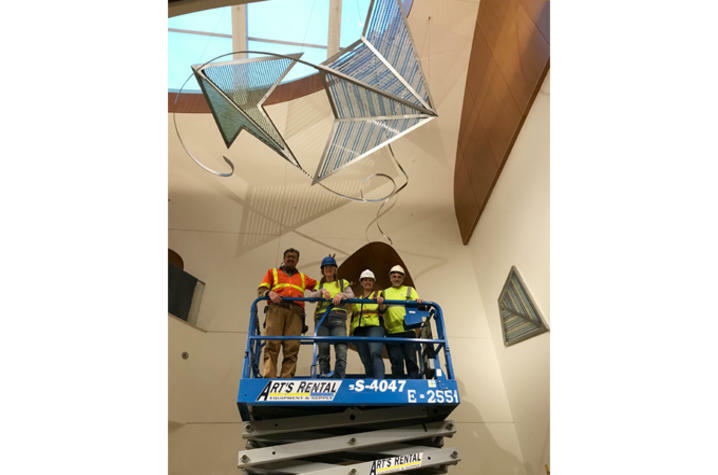 The process for creating art for the hospital is not an unfamiliar one for Strecker, having already created a colorful glass installation inside The Karpf Auditorium in Chandler Hospital. Her belief that the need for soothing art for patients and their families was soundly reaffirmed after spending months at Chandler at the bedside of her ailing mother. "It really drove home how important it is for people that are here for a long time that there are beautiful places to go," said Strecker. "I came to the conclusion even more clearly, after months in the hospital with my mother, that all the wonderful arts and arts programs are so vital to people and their families struggling in the hospital. They gave me calm spots for reflection, and made the environment more joyful to be in." After their design was chosen by the selection committee in June 2017, the pair got to work immediately. The timeline between finalizing the design and its installation was unusually tight. When the lobby was still under construction, Strecker and Medwedeff had to determine where the kites would hang so that the supports could be welded into the lobby's steel infrastructure by studying architectural renderings and blueprints. As part of their proposal to the selection committee, Strecker and Medwedeff wanted to include to an element of public participation by having the colorful marbles for the inserts donated by the community. Strecker made public requests for marbles on social media and at community events such as family night at Lexington's Living Arts and Science Center. Of the 56,000 marbles used for the project, 26,000 were donated. Contributions ranged from bulk purchases from the internet to quantities with personal significance. "We had many families give marbles in quantities that marked how many days their child was in the hospital," said Strecker. "One mother gave 115 marbles in honor of the 115 days her baby was in the NICU." Lauren Johnson, a fourth grade teacher and member of the Parent Partnership Council at Kentucky Children's Hospital, heard about the call for marbles and knew right away that her students would want to help. They brought in marbles by the bagful as part of their monthly "kindness challenge". Coincidentally, one of their classmates was undergoing major surgery at KCH at the same time. The project was a personal one to Johnson. Three years ago, her son Carson was born at UK with a genetic heart condition. He spent several days in the Neonatal Intensive Care Unit (NICU) before going home with hospice care. He passed away a month later. "Losing Carson was so hard but I’ve met so many wonderful people", said Johnson. "I’m trying to turn such a tragic experience into something positive." For Strecker and Medwedeff, creating the kites and transporting them to KCH was an exercise in math and logistics. 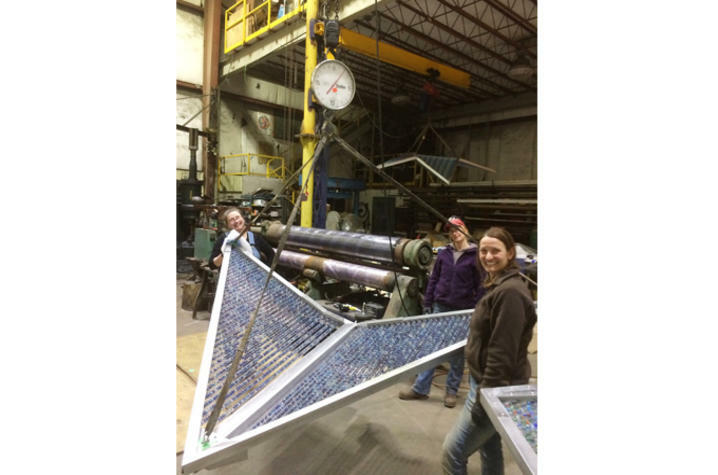 "Erika and I have independently built numerous monumental sculptures, far larger and heavier than the kites, so the scale of the project was well within our collective wheelhouse," said Medwedeff. "However, the kites required computer modeling and machining processes that were outside of our studio practices, so we turned to a machine shop with those capabilities for assistance." Strecker and Medwedeff took a divide-and-conquer approach to the fabrication. While Medwedeff and his staff built the rail system in Medwedeff's studio in Illinois, Strecker collected and sorted marbles and worked out the color schemes. In March 2018, the kites were delivered to KCH in the "the biggest box truck we could get our hands on". Strecker, Medeweff and their team spent eight days installing the kites, during which they were observed by a member of their key demographic. "A little boy in a wheelchair with an IV in his arm was watching us work through one of the uncovered windows," said Strecker. "His face just lit up, his eyes widened. His reaction reinforced and reminded us exactly why our work is necessary and important." "We are thrilled with the result," said Akhtarekhavari. "The kites truly seem meant for the space." 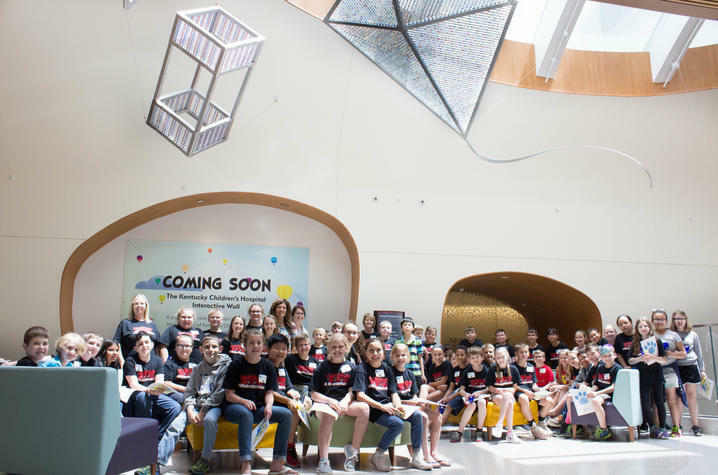 On May 17, 2018, Johnson brought her students to KCH to see the finished kites and to meet with Strecker. To Johnson and Strecker, the kids' excited reactions were priceless.